i personally love favorites posts and i want to do my best to do them every single month to round up what i have been loving and it always encourages me to try new bit which is really bad for my bank balance but oh well. i’m just a beauty addict. 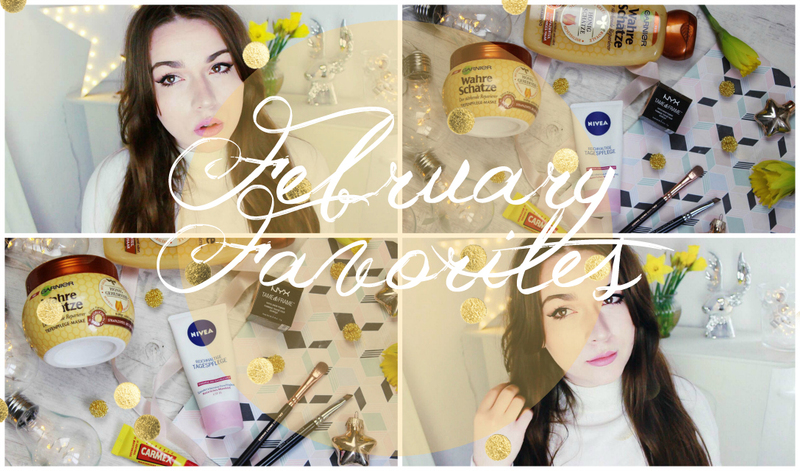 so lets jump right into my favorites of this month. for my skin i have been loving the nivea moisturizer for dry and sensitive skin. i need a rich moisturizer because my skin i dry but the one i have been using was a bit too much for day time use and my make up wasn’t sitting right anymore so i stepped back and got something very simple and its amazing. rich but light and perfect under make up. also, its very, very cheap. always a plus as i don’t want to spend loads on skincare sometimes. as i sad, my skin is dry and so are my lips. when i was 17/18 i used to love carmex and when i needed a new lip balm i decided to go for carmex again as it is very affordable and i used to love it. the scent is very odd, a bit like glue but it works like an absolute dream and my lips feel so much softer now. i always use it before i go to bed and its amazing. for my also dry hair, i tried the new garnier range and i went for the shampoo and mask with honey. it smells amazing. very sweet and warm and most importantly it keeps my hair so super soft and nourished and it keeps my hair grease free for so long and i love it. if you have dry or damaged hair you have to try it. its the best. for make up i have been loving the nyx tame & frame brow pomade which i only got last week but its the best. its so easy to apply and i love the way my brows look with it. its not too harsh and just looks good. i love waxy bases for my brows so this is perfect for me and nyx doesn’t really break the bank so thats a plus in my books. i have yet to get the all so famous zoeva rose gold brush set but zoeva brushes are just amazing and i need more of them in life. for my brow pomade i got a liner brush and as a magazine freebie i got a luxe shader brush and they are so sooo good. the bristles are super soft and dense and they apply the pigment so evenly and lovely. they are surely the best brushes i have ever tried and i want more. so here we go. my february favorites done. let me know what you have been loving and if you like these kinds of posts.